Dr. Michael Landis is a postdoctoral fellow in the Department of Ecology and Evolution Biology at Yale University. 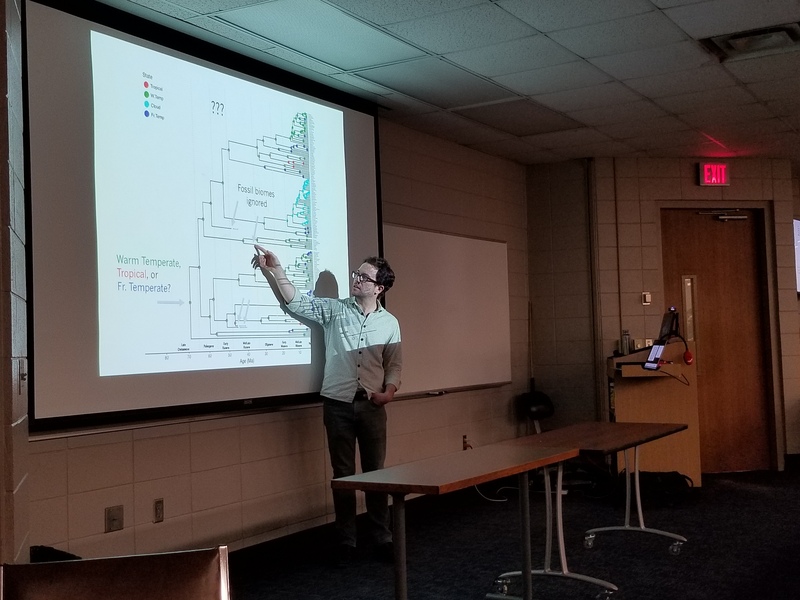 He spoke about "Joint Bayesian inference of phylogeny and biogeography with examples in Viburnum and silverswords" at Auburn University’s Department of Biological Sciences on January 17. His presentation discussed his role as an evolutionary biologist, researching how species diversify in a spatial context. The foundation of his research is that phylogeny and biogeography are coequal and can be used together for a joint analysis for molecular and biogeographic data. Dr. Landis shared an array of interesting data from a collaborative project on the 163 species of Viburnum. He showed that incorporating biogeographic fossil data into the phylogenetic analysis helped recover a warm, wet ancestral condition for the clade, rather than freezing conditions, as was previously thought. Dr. Landis also discussed his analysis of data on the 33 species of the Hawaiian Silversword, an iconic adaptive radiation. The silverswords have no fossils, so the exact age of the radiation is poorly understood. He showed that by incorporating island ages and biogeography into the analysis produced age estimates for the clade. Silverswords appear to have dispersed towards young islands but diversified primarily on islands as they grew old. Dr. Landis has recently accepted a tenure track position at Washington University in Saint Louis. He is a developer for revbayes.com, a software package for joint Bayesian inference under complex models. 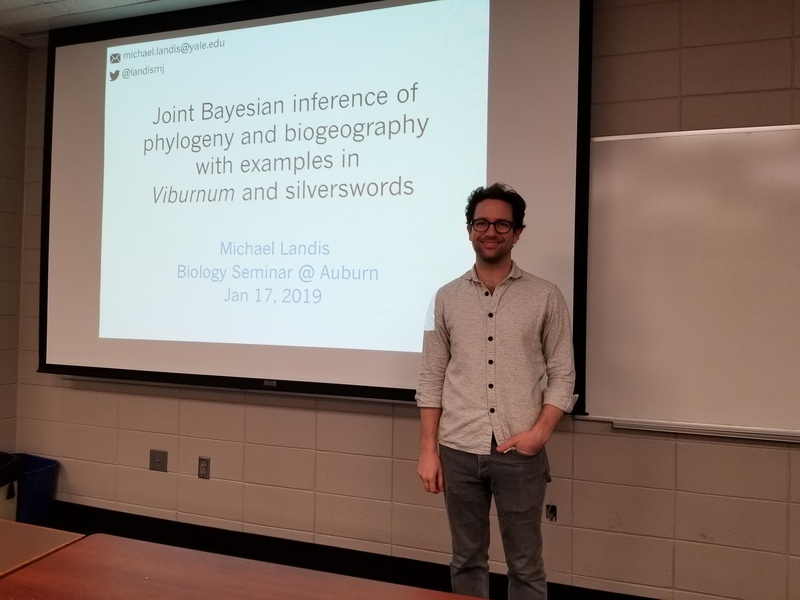 Dr. Michael Landis speaks at a seminar at Auburn University’s Department of Biological Sciences in the Rouse Life Science Building. Dr. Michael Landis discussing research about biomes.